Missa solis, Requiem for Eli / Nigel Westlake. 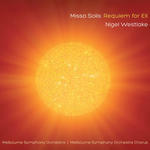 Missa Solis - Requiem for Eli : for symphony orchestra, SATB chorus & male treble solo / Nigel Westlake. Missa Solis - Requiem for Eli : study score / Nigel Westlake. Missa Solis - requiem for Eli : SATB chorus score with piano accompaniment / Nigel Westlake. Over a long a protracted evolution, and forged by overwhelming tragedy, Missa Solis - Requiem for Eli has become a profound expression not only of grief, but also of joy and celebration of the life of my beloved son Eli, who's life was cruelly taken some weeks before his 22nd birthday. Instrumentation: 2 flutes (doubling piccolo), 2 oboes (2nd doubling cor anglais), 2 clarinets (2nd doubling bass clarinet), 2 bassoons (2nd doubling contra-bassoon), 6 horns, 3 trumpets, 2 trombones, bass trombone, tuba, timpani, percussion (6 players), 2 harps, piano/celesta, SATB choir, male treble solo (or female soprano solo, senza vibrato), strings. Commission note: Commissioned by Melbourne Symphony Orchestra. Developed from music composed for the documentary Solarmax. Awarded 'Work of the Year: Orchestral' at the 2012 APRA/AMC Art Music Awards. Kit: Sydney Symphony 2011 Education Program : Australian music & Stage 4 concerts, resource kit. 17 May 2014: at The Fire and the Rose (Llewellyn Hall ANU School of Music). 13 Jul 2013: at Michael Fulcher and the Choir of Trinity College, Melbourne (St John's Cathedral, Brisbane). Featuring Michael Fulcher, Michael Leighton Jones, Trinity College Choir, University of Melbourne. 20 Oct 11: featuring Nigel Westlake, Sydney Symphony. 19 Oct 2011: at Beethoven, Westlake, Ives (Sydney Opera House, Concert Hall). Featuring Nigel Westlake, Sydney Symphony. 19 Feb 2011: at Melbourne Symphony Orchestra (Sidney Myer Music Bowl). Featuring Melbourne Symphony Orchestra, Benjamin Northey.